I’ve got another gorgeous Antipodes product to share with you today, this time it’s the Jubilation Ultra Nourishing Hand and Body Cream! After my last Antipodes experience I was really excited to try this! Jubilation comes in a generously sized 120ml metallic green tube and it’s the perfect cream for treating anywhere on the hands and body suffering from excessive dryness over the winter months. The cream contains the perfect combination of amazing ingredients including superfruit kiwi seed oil, wild blackcurrant, premium avocado oil, and meadowfoam seed oil. The cream also includes essential omegas 3, 6 and 9 and an excellent dose of Vitamins A, C and E provide the ultimate daily nutritional skin boost. As well as being packed with fantastic beneficial ingredients, it also has a beautiful fruity scent of fig, feijos and wild blackcurrant. This cream really is a joy to use. Apart from the scent, which I can’t get enough of, it has a luxurious texture that really does moisturise and help to heal dry areas. My skin has just soaked this stuff up! The price is a bit on the steep side but I’d still highly recommend this product – plus it would make an excellent Christmas gift! 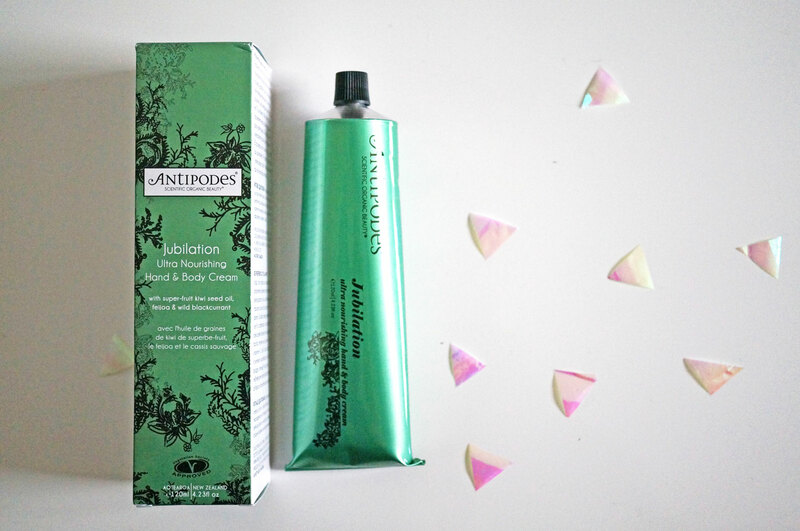 Antipodes Jubilation Ultra Nourishing Hand and Body Cream is available from Feelunique for £26.99. Previous Post Under £15 Budget & Novelty Gift Guide For Her!